Gulnoza joined the Post-Graduate Fellowship program in 2011 and worked on the Integrated Surveillance Systems research team while at IHME. During her fellowship, she designed a component of the health facility surveys used for the Salud Mesoamérica 2015 Initiative and worked on involving some of the former Soviet Union countries in IHME’s Access, Bottlenecks, Costs, and Equity project. After IHME, Gulnoza went on to work as a senior research scientist at the Public Health Foundation of India. 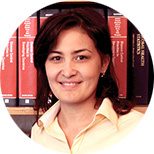 Usmanova G, Neumark Y, Baras M, McKee M. Patterns of adult tobacco use in Uzbekistan. European Journal of Public Health. 2011 Sept. 9; doi: 10.1093/eurpub/ckr125. Usmanova G, Neumark Y. Age of initiation and intensity of cigarette use among smokers in Uzbekistan. European Journal of Public Health. 2009 Nov.; 19(Suppl. 1):51-52. Usmanova G. Socioeconomic differences in the prevalence of active and passive tobacco smoking among cancer patients in Uzbekistan. Lung Cancer. 2009 May; 64(Suppl. 1):S28. Usmanova G, Mamatova N, Shukurov Sh, Yurekli A, Makhamova N. Economic and health costs of smoking in Uzbekistan (based on the results of household inpatient, and outpatient surveys). Tashkent, Uzbekistan: 2007.